The avoidance of the word “terror” in public discourse should be discussed further, not for the sake of defining scientifically the appalling act, but because of necessity to address the imbalance behind the silence. The act of terror was not termed as such precisely because the perpetrator has not come from the broadly expected background for a terrorist act – this was a very non-Muslim, very white, not a Middle Eastern but more of a Midlands’ act of terror. And if it is true that the perpetrator was shouting “Britain first” – as some media report quoting eyewitnesses – then the act of terror comes, paradoxically or not, on the wave of fear of terrorism which supposedly will have to come from the “others”. However, in contrast to the media which haven’t deployed the terrorism-related rhetoric, the police have probably followed some strictly defined procedures for the case in which a politician is assassinated in public, and the counter-terrorist forces were rightly deployed. I am certainly not arguing that the media should follow the police in creating a strict procedure when the terrorist rhetoric should and shouldn’t be used, but I am nevertheless saying that the police have reacted to the event more adequately than the media. Although motives behind the crime are still to be explored and determined, there is enough ground to say that the fear of “other and otherness” coming from abroad had obviously been a driving force for the act of domestic terror. At this tragic point one should recall the words of Franklin Roosevelt, my otherwise unfavourable American president, who on one occasion in 1932 had said that the only thing “we have to fear is fear itself”. And this is something which must be emphasised in the context of different political campaigns and the media, aiming at scaremongering in relation to immigration and playing with people’s fears. All we have to keep in mind and fear about in the context, is actually the fear itself. The paradox of the tragedy is that the fear of an enemy who will come as stranger from abroad had driven the domestic, a familiar name-and-face fascism. And if it is true that the perpetrator was a bit of a loner but also active in his local community, while in parallel learning from neo-Nazi websites about weapons and explosives, it also explains why some of the media were unprepared to cover the tragedy adequately and will probably avoid to discuss in depth political background of the Jo Cox’s murder. 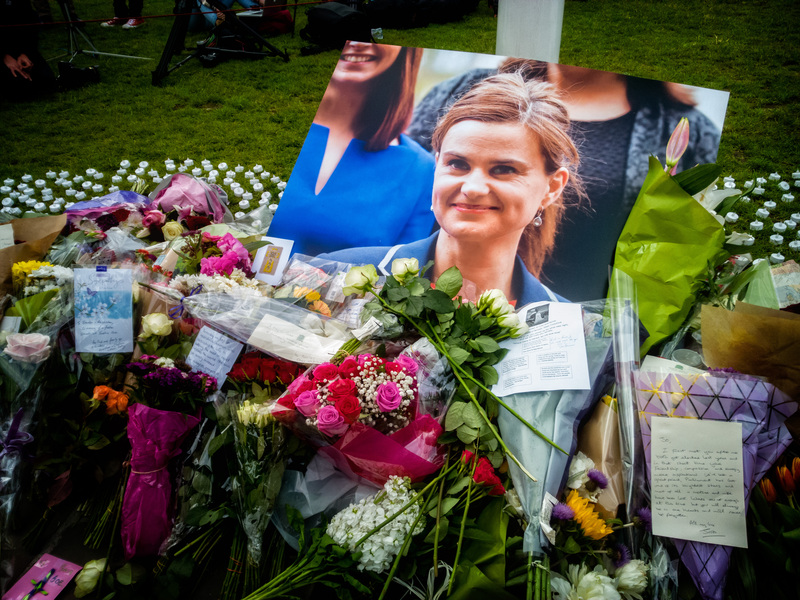 And this is precisely what must be avoided – that de-politicisation of the murder would nobody do a justice, given Jo Cox hasn’t died accidentally, but has fallen because of what her political standpoints were and what she bravely stood for.